Once again I have started my hunt for a comfy and stylish rocking chair. I began the hunt when I was pregnant with my first and I am sad to say that I never quite found what I was looking for. In fact, I ended up settling for just a plain wood rocking chair because I thought I would rather have that then a big poofy recliner type of thing. Boy was that a mistake. After countless nights and hours upon hours spent with a colicy/acid-reflux baby I wished more then anything that I could just have a comfortable rocking chair that I could relax or maybe even sleep in as I nursed and rocked my baby through the wee hours of the morning. 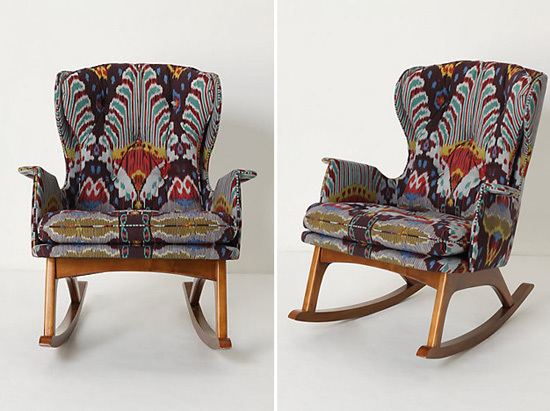 It's the Finn Rocker from Anthropologie...and it makes my heart skip a beat. I havn't had the chance to sit in one, but it looks very soft and comfortable, and the curved top seems like it would make a nice little resting spot for my over-tired head. Now comes the sad part...There is a reason why this post is appearing on"Inspiration Thursday." Because the $1,698.00 price tag means that I will never own it (unless it happens to go on a REALLY good sale). What I am hoping will happen, is that I can use this chair as "inspiration" and find a similar one (most likely used) that I can re-upholster. By the way, I am being featured today on one of my new favorite design blogs, Danielle Oakey Interiors. So head on over and check it out! Found your blog on Danielle's blog- LOVE your style and def adding you to my blog roll! That is the perfect rocking chair!! I hope that you can find something similar at a more reasonable price! My dad got my mom a rocking chair when she was pregnant with me and she just told me it was is still one of her all-time favorite presents! A good rocking chair is vital! I love it! I am sure you can find something similar on craigslist and make it just as pretty! Thanks again for participating in my series! I found your blog through Daniel Oakey's and I love it! I found this rocker the other day at Urban Outfitters. It has similar lines and is WAY cheaper than the Anthro rocker. Good luck! ugggghhh! why does anthro have to be soooooo pricey!!? That darn Anthro! I have the same feelings about their furniture- it breaks my heart everytime I see that ridiculous price tag! I am excited to see you make your own! Congrats on the feature! Seriously the best chair. Rocking chairs can be really uncomfortable and this one is just darling. Oh my.. that chair.. it's gorgeous! I absolutely love the pattern!